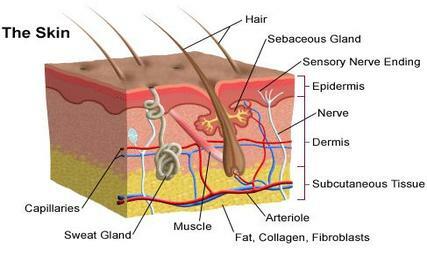 - The deepest layer of the epidermis is the stratum basale (stratum germinativum), a layer of stem cells that produce all of the keratinocytes, or skin cells, in the epidermis. If this layer is destroyed in a particular region, the epidermis cannot regrow and is replaced by scar tissue. Melanocytes found in this layer produce the pigment melanin to give the skin its coloration and protect the body from ultraviolet radiation. Special touch sensitive cells known as Merkel cells are also present in the stratum basale to detect the shape and texture of objects touched by the skin. - Superficial to the stratum basale is a thicker layer of epidermis known as the stratum spinosum, or spiny layer. Young keratinocytes are pushed into this layer from the reproduction of stem cells in the stratum basale. In the stratum spinosum, these keratinocytes begin to fill with keratin and form spiny connections between cells known as desmosomes. Desmosomes hold the cells together tightly while keratin fills the cells and gives the skin its strength and water resistance. - The next layer, the stratum granulosum, is a thin layer featuring granular keratinocytes that have been pushed out of the stratum spinosum. The granular appearance of keratinocytes is due to keratin and other chemicals accumulating inside the cells. Keratinocytes in the stratum granulosum also secrete lamellar granules, a waterproof substance that prevents water from leaking out of the body’s tissues or leaking into the body from the external environment. - Beyond the stratum granulosum the keratinocytes are cut off from their blood supply and begin to die, resulting in layers of dead keratinocytes on the body’s exterior. In the thick skin on the soles of the feet and palms of the hands the stratum lucidum is a thin, transparent layer of dead keratinocytes lying superficial to the stratum granulosum. The outermost layer is the stratum corneum, a thick layer of dead, flattened, keratin-filled keratinocytes that protect the underlying tissues. Dead keratinocytes slough off from the exterior surface of the stratum corneum only to be replaced by new cells emerging from the deeper layers. - The papillary layer is the most superficial layer of the dermis; it contacts the epidermis. Between the epidermis and dermis it forms an undulating border that is rich in blood vessels and nervous tissue. These nervous and vascular tissues support the epidermis while the undulations, known as dermal papillae, increase the surface area of this border region. - The reticular layer makes up the majority of the skin’s thickness and is primarily made of dense irregular fibrous connective tissue. A thick web of collagen (the strongest protein found in nature) and elastin fibers makes up the dense irregular connective tissue and provides great strength and elasticity to the dermis. Many arterioles and venules also pass through the reticular layer to provide blood flow to the superficial tissues of the papillary layer and epidermis.